Gar and Trudy Sawtelle breed and train dogs (a fictional breed) that have come to be known for their incredible intelligence and charisma simply as “Sawtelle dogs”. When Edgar was born mute, their dog Almondine was his voice — if he woke up crying silently, Almondine could sense something was wrong with Edgar and wake his mom. As Edgar grows up, he takes part in raising and caring for the Sawtelle dogs with his parents, and develops a special bond with Almondine. When Gar dies suddenly, Trudy and Edgar are thrown headfirst into a downward spiral. Can they keep the kennels and dog training with just two people? When Edgar’s uncle Claude returns and starts getting close with Trudy, Edgar can’t handle it. 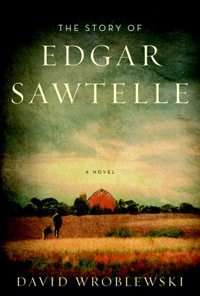 After a fateful accident in the barn, Edgar runs away but soon discovers what it truly means to have a Sawtelle dog. I enjoyed The Story of Edgar Sawtelle; it was well written, interesting, unique, and a little mind-boggling at times. I definitely wanted to find out what happened with Edgar and Trudy as both such relatable characters. Edgar, although fluent in sign language, has trouble expressing himself and trusting others once his father dies; Trudy, who miscarried before Edgar was born, often has to suppress the “black seed” of depression that fluxes inside her. This book has gotten a lot of hype and while I definitely liked the book, but I’m not head-over-heels-in-love with it. I can see why Oprah would pick it for Book Club as it would satisfy a wide range of audiences. I certainly fell into the book — every time I picked it up, I was sucked back into the story. It was intriguing and I don’t have anything bad to say about the book, and the only thing that I felt was lacking was seeing how Trudy was doing while Edgar was out in the wild as a runaway (previously the POV switched around). Eventually, she understood the house was keeping a secret from her. All that winter and all through the spring Almondine had known something was going to happen, but no matter where she looked she couldn’t find it. Sometimes, when she entered a room, there was the feeling that the thing that was going to happen had just been there, and she would stop and pant and peer around while the feeling seeped away as mysteriously as it had arrived. Weeks might pass without a sign, and then a night would come, when, lying nose to tail beneath the window in the kitchen corner, listening to the murmur of conversation and the slosh and clink of dishes being washed, she felt it in the house again and she whisked her tail in long, pensive strokes across the baseboards and silently collected her feet beneath her and waited. When half an hour passed and nothing appeared, she groaned and sighed and rolled onto her back and waited to see if it was somewhere in her sleep. Full disclosure: I received a copy of the book from the publisher for review purposes. This situation did not affect my review in any way, shape or form. This does sound interesting. I’ll wait till the Oprah rush is over and check it out then. I’ve had this on the TBR list for some time. I will have to pick it up.